Start FRESH with a CLEAN slate…clear your path for what is emerging, EXPAND and savor your capacity to enjoy a REALLY GOOD time. Our whole-body experiential explorations in this introductory event will shine a light on your POTENTIAL for ALIVENESS and deliver new ways of navigating in the unknown to make your evolution more FUN, FRIENDLY and inviting. Our intention is that you complete tonight’s adventure feeling INVIGORATED, appreciated and motivated to expand your capacity for what’s possible BEYOND THE BOX OF YOUR INHERITED PATTERNS. Bring your willingness to discover something new, bring your sense of humor, and come as you are, already WHOLE and complete. The introductory event is on Thursday March 19, 6:30-8:30pm, at The Genius Place, 2354 SE 59th Ave, Portland, OR 97215, just north of SE Division. Contact Laureli Shimayo with questions before the event at 720-3352-2434 or laureli@thrive-wise.com. Donations will be gratefully accepted. The Radiance Process was initially developed by world renowned relationship and aliveness experts, Drs. Gay and Kathlyn Hendricks. It provides an opportunity for easeful, rapid evolution. Radiance supports the resolution of freedom from repetitive issues, including those that don’t resolve through verbal processing. The uniqueness of this work is that it bypasses the mind and invites changes that are felt immediately and directly on a whole-body level. * Expand your capacity for joy, clarity, ease, and rich relationship connections. * Provide yourself an experience of whole-body welcoming…totally lovable, fully wanted, and supported as you. * Support your growing experience of vibrant well-being, healthy satisfying relationships, deep fulfillment, and full creative expression. * Fully express your creative individuality while in relationships with others. Audrey Hazekamp, M.A. and Anna Downing, LMT now offer this easeful, whole-body process, inviting you beyond your limiting beliefs and into a felt sense of being welcomed, loved, and supported into your biggest life. Anna and Audrey are strong, clear, and loving mid-wives for transformation. 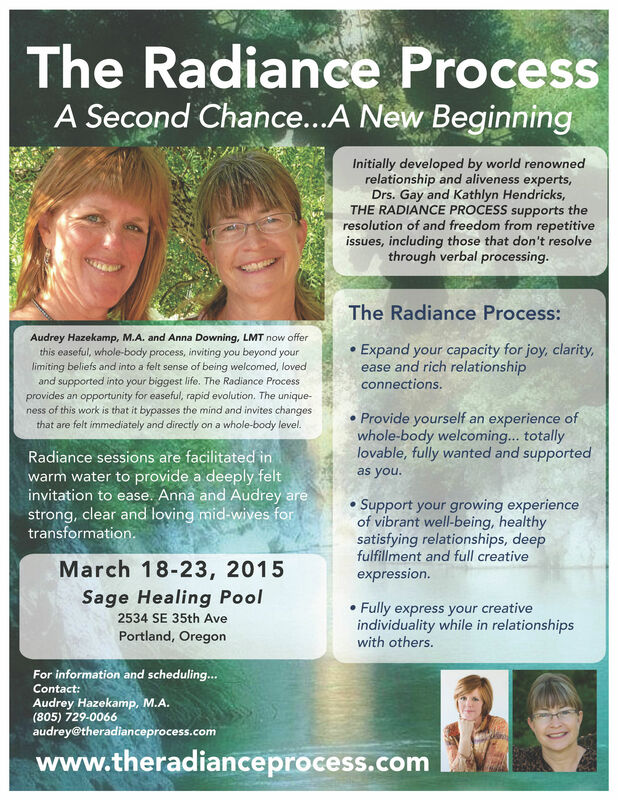 Radiance Sessions will be offered in SE Portland on March 18-23. See www.TheRadianceProcess.com for more information. Contact Audrey Hazekamp at 805-729-0066 or audrey@theradianceprocess.com to schedule.